Does your pet dog know and have insight into your family’s daily activities? If so, you will smile and enjoy the short, light, humorous poems in Raspberry’s Reflections. Raspberry, like many dogs, reflected a humorous canine insight and perspective on her daily activities. Her actions and demeanor in this role inspired the author to capture her thoughts on family and daily life. While enduring the usual “rules” established for the family dog, Raspberry loved her daily functions as playmate, trusted companion, and watchdog. Whatever the circumstance, she was always ready for fun, and to be a part of the next family adventure. Relocations in Raspberry’s life exposed her to new climates, homes, people, and terrain. With understanding and maturity, she simply mixed them all together into her point of view. This tale by Raspberry is endearing. The loving connection between dog and master speaks volumes. Anyone who has had a dog as a pet, knows the feeling that the dog is almost human, sometimes more human than real people. These relections leave the reader with the feeling, that while he never personally knew Raspberry, he does now. And he loves him! Raspberry's reflections is an enchanting book about a curious puppy named Raspberry. 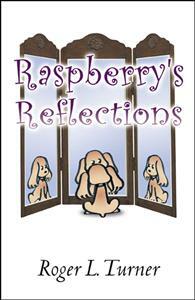 His storys weaved into poems tell about this dogs life from Raspberry's point of veiw. You should definetly read this book weather you are a raspberry fan or not!